Mayor David Condon spent a portion of his 44th birthday directing a crowd to the raging waters of the Spokane River behind them. “Today, we’re experiencing the next evolution of a river that’s once again firmly implanted as Spokane’s identity and has spawned thinking that has given us much of our recent innovation,” the mayor said Friday in his State of the City address, delivered at the downtown Spokane Convention Center. About 400 members of a sold-out crowd gathered by Greater Spokane Incorporated listened as Condon outlined details of a two-year plan that will infuse an additional $52 million in public investments. Some were basic, like continued rebuilding of the city’s streets, part of a voter-approved bond measure four years ago. Others seemed more fantastical, like the inclusion of “a potential zip line” as part of a westward expansion of Riverfront Park to connect with the Peaceful Valley neighborhood. The new attraction, which could begin on top of a plaza that is being built above a stormwater tank under construction downtown, “would take you on a new river experience, along that line, underneath the Monroe Street Bridge to Glover Field,” the mayor said. In an interview this week, Condon said the proposed zip line was still in the idea phase and there weren’t firm plans for the attraction. City officials have said such a zip line would require buy-in from adjacent property owners, including the Spokane Club. That work also would be separate from the $64 million taxpayer-funded renovations underway inside the park. Condon highlighted the skating ribbon, which had a strong first two months of operation but has been shuttered due to an equipment leak, and the approaching opening date for the new home of the Looff Carrousel. In one of the videos shown during his presentation, the city highlighted the efforts of Melissa Halvorson, a recent graduate of a city program providing apprenticeship training for contracting work, who is working on the Looff building. 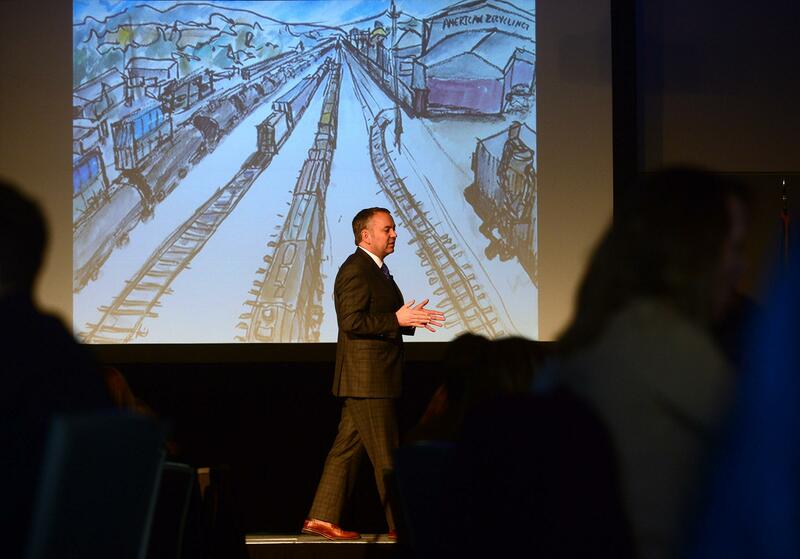 Condon’s speech was punctuated by drawings and paintings from local Spokane artist Megan Perkins, who the mayor said had spent the past year working on pieces depicting famous landmarks and landscapes of the city. Many of those images included scenes of the rushing Spokane River and falls, and Condon pointed out that the city was close to completion of a main initiative of his early years in office – a $350 million plan to reduce water pollution. The city is pushing forward with completion on the construction of massive subterranean tanks intended to prevent stormwater runoff from overflowing and sending untreated sewage into the river. The mayor has since spoken with the Environmental Protection Agency in an attempt to avoid enforcement of new pollution standards that are more stringent than can be tested for with modern equipment, though some river protection groups and City Council members have cautioned against this approach. At the end of his speech, Condon unveiled a new social media initiative he said should emphasize Spokane’s most signature asset – the kindness of its people. The mayor encouraged residents to share images of people in Spokane over the next seven days being kind to one another using the hashtag #SpoKind. The effort was launched by volunteers in 2014, and Condon urged people to take up the charge “during a week that’s devoted to love and kindness” with the approach of Valentine’s Day on Wednesday. Condon told the crowd the focus of his efforts in the final two years in office would be to re-establish the river’s prominence in town, as part of an effort to make Spokane safer, smarter and healthier. “Spokane is on the verge of an amazing opportunity,” the mayor said. Published: Feb. 9, 2018, 5:18 p.m. Updated: Feb. 9, 2018, 10:08 p.m.